Pioneer BDR-101A is the first internal Blu-ray burner (writer) for PCs that writes to BD (Blu-ray Disc). The Blu-Ray Disc burner will utilize shorter wavelength blue lasers in order to store up to 25 gigabytes of information on a single layer Blu-ray Disc. 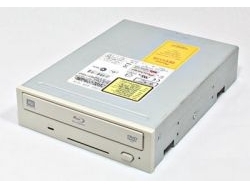 Pioneer BDR-101A Blu-Ray writer capable to write BD-R/BD-RE at 2x and read BD-ROM discs at 2x. It has a single-lens optical pickup with two lasers: a blue laser capable of reading and writing to BD, and a red laser for DVD media. The BDR drive is extremely fast compared to prior formats debut drives: 1xCD (0.18MB/s), 1xDVD (1.39MB/s), and 1xBD (4.56MB/s), and thus the rotational speed reached by a 2x Blu-ray is equivalent to 6.59x DVD or 51.73x CD. The drive also supports DVD-R DL and DVD+R DL, although CD-R, CD-RW and DVD-RAM are not supported. PC Advisor tested a production-level BDR-101A drive using shrink-wrapped BD-R media from TDK Electronics, and close-but-not-quite-final software from Sonic, with conclusion that it’s going to be a year before Blu-ray becomes a viable option for most users. The early signs are good, though, and while this drive has its limitations, it’ll be of interest to professionals who need a high-capacity drive and early adopters who can’t wait to get their hands on the next big thing.